How To Make a Scene. How to avoid writing by using the "Insert Menu Add-on". 2. Basics on How To Make a Scene About writing the text, "//" und "/* ... */". xyz - Three-Dimensional Coordinates: Floats, Vectors (< , , >), Calculations. 3. Scene Structure - What belongs to a Scene? A basic example of a scene description. 4. Scene File Headers:, #include files, camera, light_source. and other shapes (shapes.inc, height_field, text, isosurface). CSG - union (merge); difference; intersection. 7. Colors on Surfaces. texture, pigment, normal, finish. 8. #declare, #local, #macro, - About placeholders and flexible objects. 9. #while - Mass production deluxe with loops. 10. #include. - Include files and re-usable objects. Don't build everything from nothing! 11. Tips and tricks for efficient working. Adapting POV-Ray 3.1 scene files to POV-Ray version 3.5/3.6. Adapting POV-Ray 3.5/3.6 scene files to POV-Ray 3.7. 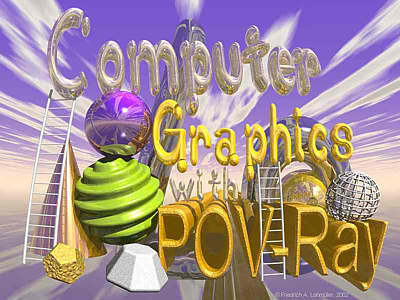 Using POV-Ray 3.6.2 and 3.7 with Windows Vista. The following short introduction gives an overview on POV-Ray, the Persistance Of Vision Raytracing Programm. It does not intend to be complete! This description aims to give a fast help to beginners by explaining the basic rules. the original sample files of POV-Ray (see the subdirectory "scenes"!). For feedback and ideas to enhance this tutorial, just drop me some lines by email - thanks! NEWS: 08-Nov-2013: POV-Ray 3.7.0 released! The ability of SMP (Symmetric multiprocessing) with today very common multicore processors speeds up rending process enormously ( z.B. Intel i7 -> 4 cores -> 8 threads parallel -> ca. 8 times faster! ). In addition POV-Ray 3.7 has a revised 'Insert Menu', which now contains most of the important parts of my old 'Insert Menu Add-on' for POV-Ray 3.6.2 . Also some include files for new shapes come with 3.7.0. New among others are the for-loop (#for(COUNTER,START,END,STEP) .... #end), diverse new pattern functions and also the possibility to make images in JPEG format (space-saving!) as well as in .hdr format. And we can now use HDRI images for indirect Illumination of our scenes (HDRI environment mapping). My former include file 'shapes_lo.inc' is replaced by the enforced file 'shapes3.inc' with POV-Ray 3.7.0. This file and the according template textes of the Insert Menu (optional in HTML) already can be downloaded from my Download Page.